Get a Home Owner's Insurance Quote Today! Get a Auto Insurance Quote Today! Having the right insurance coverage is important. Without it, you leave yourself open to the possibility of financial loss or ruin. Protecting your assets means protecting what you have worked hard to build financially. Life happens when we least expect it…accidents, natural disasters, illness, and other occurrences that come without warning. With the proper auto, health, life, and business insurance, you can find peace of mind knowing the things that are important to you are protected. We are a multiline insurance agency and have been serving Murrieta, Temecula, Menifee, Hemet and surrounding Inland Empire residents for more than four decades. Multiline insurance policies offer the benefit of combining multiple insurance policies into a single policy. By using multiline insurance I can offer you simplicity and cost-effectiveness when it comes to getting the right and best insurance coverage for you, your family, and your business. Have your home insurance needs changed? We know there is no “one-size-fits-all” insurance policy which is why we personalize your coverage to meet your needs. 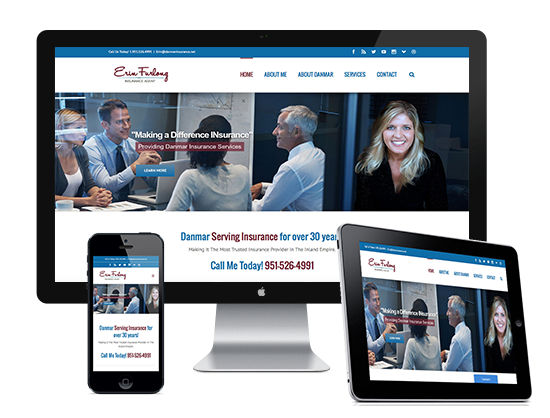 With a wide range of coverage options from life insurance to business insurance and most everything in between, Erin Furlong offers a personalized experience when seeking to help find you the best insurance options. Whether it’s standard coverage or superior protection options, I recognize the value in building and maintaining strong relationships with our customers. They’re not just policyholders- their people. When it comes to the unexpected, Erin Furlong will to help you plan accordingly. In the event that the unexpected does happen, we will be with you every step of the way to help you get things get back on track. Serving Your Home, Auto & Business Insurance Needs! Getting a quote is fast and easy. Let me take the guesswork out of finding you the right insurance coverage at the right price. When you’re looking for insurance there are so many variables. I’ll take the confusion out of finding you the right insurance provider. My job doesn’t end there but will continue well into the future. When you work with Danmar…your a customer for life. When you have any questions about your insurance needs were always a call or click away. So start saving and allow me to serve you. We are fully dedicated to our client base. When you insure with Adobe Insurance Brokers, there is no need to worry about customer support. With over 10,000 customers and counting, you cannot go wrong with Adobe Insurance. Check out what our clients are saying about Erin Furlong and Adobe Insurance Brokers! Thank you so much for the referrals. I went with Adobe (Erin) and it was really a great experience. By far, she was amazing above all and it was not just the quote price. She was very responsive and I learned a lot about my coverages without Googling. There is something about that personal agent connection (like old school) that is appreciated. I have my other house and I will tell you that it was very stressful trying to know what I was covered for. Never did I feel that with her and if anything, it made me a lot more secure. I just wanted to be sure that you know when you refer to other buyers/clients in Escrow, that you can move Adobe to the top. J I went through the same conversations with each agent below, plus two other non-referred quotes. While most were pleasant, Erin was above and beyond. If any of my friends ask me, I will be referring her, but I am sure you will have more opportunities to me. I rarely write up any feedback or do survey’s, but I asked her to send me one for sure. It is because of her hard work that I felt inclined to put in my own effort as a thank you to her. So thank you as well for the referral! We recently switched our Homeowners and Auto insurance to Erin. With Erin we have gotten personalized service, we get to deal with her directly, and she responds quickly to our phone calls and emails. She is a “get it done” type of agent, and we appreciate that! We would highly recommend her! You won’t be disappointed! Erin Furlong quoted me for my personal cars and home insurance and saved me several hundred dollars. She made the process easy for me to change insurance companies. It is very easy to get ahold of her to answer questions or to discuss any needs I have. A couple months after using Erin as my insurance agent my husband and I bought a commercial vehicle and Erin was able to help me get insurance on the vehicle all over email and texts while I was at work. I fully trust and would recommend Erin Furlong with any and all your insurance needs. Our business moved all of our insurance over to Erin. She has provided us with the ease of combining our insurance with one company while saving us a large amount of money. The Adobe agency is also very helpful. The girls in the office are very prompt in handling any of our needs. I would highly recommend Erin Furlong as your insurance agent, you won’t be disappointed!